In 2011 we moved to the beach and was born El Niño Surf Center, the first center of nautical activities dedicated to Stand up paddle surfing, windsurfing and kite surfing on the beach in Palma. Thanks to the dedication and great success of the slide on the island sports, today is a center of great prestige throughout Spain, and thanks to our infrastructure we drove around the island taking the Paddle Surf for all types of events and incentives. 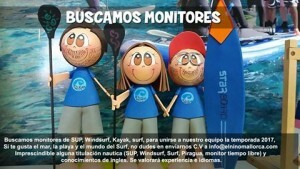 In El Niño Surf Center are courses in Stand up paddle surfing, windsurfing, surfing and kayaking run by professionals with extensive experience in the sector, all certified and endorsed by the federations.